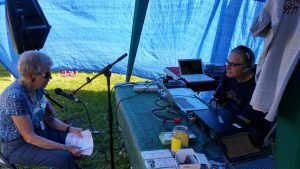 Joe Blades speaks with the president of Clan MacLean, Andrea MacLean-Holohan. Clan MacLean was the host clan of Highland Games this year, and we learned a lot of Clan MacLean’s interests in promoting heritage throughout Canada. They exist both on Facebook and they have a website set up here, and any and all relations are welcome to join them so they can get in contact with you and share all of their events. Be sure to give this podcast a listen and hear all about the rich history and troubles they’ve overcome with different projects.